Lin has been working in the complementary health field since 1995, coming to it from a commercial business management background. She initially worked with musculo-skeletal problems using Remedial and Acupressure Massage until she suffered a shoulder injury and was told she required surgery. Looking for a different approach to the injury, after all other avenues had failed, she found a Bowen therapist who resolved her frozen shoulder within three treatments. The treatment was so gentle and effective Lin decided to add Bowen to her therapy tool box and trained in Bowen Therapy with the European College of Bowen Studies. She has since trained in several different types of Bowen, as well as undertaking regular CPD training including advanced post graduate courses to enable her to manage more complex problems. She updates her knowledge regularly in this continually developing therapy and is also qualified in Anatomy and Physiology and First Aid. Lin moved her Bowen practice from Berkshire and has been established in Hastings, St Leonard’s, Bexhill and Battle since 2005. 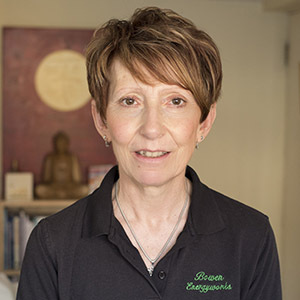 She works primarily with Bowen, using her knowledge of other therapies to support and complement her work. She is a member of the Bowen Therapy Professional Association (BTPA) who provide standards of professional excellence and a code of practice for the protection and benefit of the public and members. This means that she is fully insured and abides by formal codes of ethics and conduct as well as updating her knowledge and training regularly.